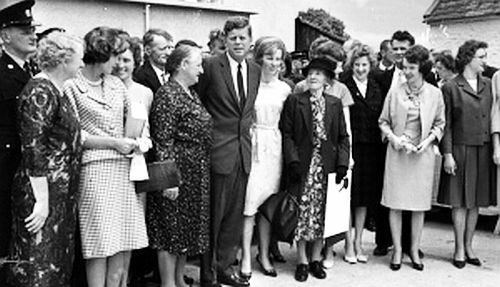 John F Kennedy poses with relatives in Dunganstown, Co Wexford, on his visit to Ireland in 1963. Mary Robinson once said that the smell of fresh paint would be one of the abiding memories of her presidency. Local communities always seemed to have redecorated whatever centre or school she was visiting just before the presidential party arrived. The smell of fresh paint, the dust of freshly laid pavements and the colours of newly planted flower beds were prominent in New Ross this week as the local authorities and shop owners busily readied the quayside for the arrival of American political royalty next weekend. The Kennedy clan are coming to town. Four miles out the road at Dunganstown the scene was also one of dust and fresh paint as the Office of Public Works put the finishing touches to the new visitor centre at the Kennedy Homestead. Curator and Kennedy cousin Patrick Grennan and heritage interpretive designer Jack Harrison have assembled a fascinating exhibition of photographs, observations and memorabilia capturing the extraordinary journey that is the Kennedy story. The visitor centre will be officially opened by Taoiseach Enda Kenny and Caroline Kennedy next Saturday afternoon. Later that evening they will also light an eternal flame to emigrants beside the Dunbrody famine ship at New Ross. It’s all part of a series of Kennedy homecoming events as three dozen American-based Kennedys join with their local cousins, the townspeople and thousands of expected visitors to mark the 50th anniversary of John F Kennedy’s visit as president in 1963. Among the dramatic works which the town council has undertaken at the quayside in New Ross has been the erection of a statute in bronze by Ann Meldon Hugh replicating a US presidential podium at the spot where John F Kennedy spoke. Having checked the online footage of the speech and even the minutes of the relevant town council meeting from 1963 the town manager, Eamonn Hore, was able to pinpoint to within a metre the precise spot as appropriate location for the podium statute. The bronze podium has already become an attraction in its own right. On recent bright summer evenings one could see people standing behind it and having their presidential speech-making pose captured on smartphone cameras. The full text of John F Kennedy’s speech in 1963 has been engraved on the podium top. The most striking thing about the speech is how short it was: it runs to just over 300 words. It lasted just three minutes. A press copy of the New Ross remarks preserved in the Kennedy Library in Boston shows four closely typed paragraphs which take up about two-thirds of a single A4 page. Footage of the speech in the library, and widely available online, suggests that the president’s jokes on the day were ad-libbed, but of course they were included in the advance text published to the press. Video: John F. Kennedy in New Ross and Wexford, Ireland, June 27th 1963. In these 300 words Kennedy managed to acknowledge and introduce the significant members of his travelling party, including his sisters Eunice and Jean. He joked about how if his great-grandfather had not left he might have been working in the local Albatros factory across the river or in John V Kelly’s local pub across the road. He also however made, in a subtle way, some significant points about the consequences and opportunity flowing from the Irish history of emigration. Speaking at the spot where his great-grandfather Patrick Kennedy had boarded the famine ship, the Dunbrody, in 1848 to begin his journey to America, Kennedy spoke of how it had taken 115 years and 6,000 miles for him to make the return journey. The point obvious to his audience of course was that while Patrick Kennedy in 1848 left as a peasant farmer John F Kennedy had come back in 1963 as president. Notwithstanding the fact that the speech was short, Kennedy’s carefully chosen words and the manner of the delivery meant none of those who waited for hours to hear him felt they had been short-changed. On the contrary, several in New Ross this week described the moment as the highlight of their childhood. It is an eloquent illustration of how something memorable yet effective can be better said in a short rather than a long speech. That which is concise is more likely to be profound. Over the course of next Thursday in Dublin and next Friday and Saturday in New Ross and in Dunganstown there will be many words spoken as national and local personalities and politicians seek to capture the relevance of John F Kennedy’s visit to Ireland in 1963. Those of us involved in putting some of the events together will be hoping to impose something approaching a 300-word limit on the speakers, at least as a general rule. We will of course be happy to grant some leeway to members of the Kennedy family, who all seem to have inherited the gift of memorable speech-making. On New Ross quayside next Saturday JFK’s grandson will speak from almost the same spot as Kennedy spoke from in 1963 to honour his great-grandfather. In many ways these are likely to be among the most poignant remarks of the weekend. In terms of memorable Kennedy speeches, in New Ross at least, the torch will pass on once more to another generation. Mr. Mayor, I first of all would like to introduce two members of my family who came here with us: My sister Eunice Shriver, and to introduce another of my sisters, Jean Smith. I would like to have you meet American Ambassador McClosky, who is with us, and I would like to have you meet the head of the American labor movement, whose mother and father were born in Ireland, George Meany, who is travelling with us. And then I would like to have you meet the only man with us who doesn’t have a drop of Irish blood, but who is dying to, the head of the protocol of the United States, Angier Biddle Duke. See, Angie, how nice it is, just to be Irish? I am glad to be here. It took 115 years to make this trip and 6,000 miles, and three generations. But I am proud to be here and I appreciate the warm welcome you have given to all of us. When my great grandfather left here to become a cooper in East Boston, he carried nothing with him except two things: a strong religious faith and a strong desire for liberty. I am glad to say that all of his great granchildren have valued that inheritance. If he hadn’t left, I would be working over at the Albatross Company, or perhaps for John V. Kelly. In any case, we are happy to be back here. About 50 years ago, an Irishman from New Ross traveled down to Washington with his family, and in order to tell his neighbors how well he was doing, he had his picture taken in front of the White House and said, “This is our summer home. Come and see us.” Well, it is our home also in the Winter, and I hope you will come and see us. This page was loaded Apr 22nd 2019, 10:21 pm GMT.